Apple Inc. (NASDAQ: AAPL) is known for its remarkable branding and marketing their product in a way ahead of its time. However, if the company can’t even make the product, there is no amount of branding that could save the product. Apple is reportedly running into issues building its next iPhone, which could hurt the “super cycle” that many analysts expected to happen in the fall with the release, which would throttle the moneymaker back to sales growth. According to multiple analysts this week, Apple is running into issues with its new fingerprint sensor, which many are expecting an upgrade to, to match the new “Infinity Display”-esque screen that the phone is projected to have. Apple is supposedly launching a new iPhone cycle, consisting of three new phones, one that is said to be superpremium with an OLED display. Because of this, the fingerprint sensor would have to be intelligently placed either on the back or sides of the phone, or underneath the display – which there is no reliable technology currently for. With these problems still occurring, and the release of the phone eminent, the company might opt into a settlement, and use facial recognition instead of fingerprint technology as their main unlocking feature, although the “Touch ID” that Apple has is likely to be much more advanced than the facial recognition software. Apple is said to have been investing in third party engineers to try and develop a solution for their specific problem. Apple iPhone unit sales declined for the first time last year and with their scheduled report results for the third quarter coming in August 1st, we can expect more clues about the iPhone launch and how Apple perceives it. Regardless of this fact, consumers are itching for a new innovative phone by Apple, and reportedly are ready to tackle the premium iPhone’s $999 price tag jumping from 25% of consumers interested in April to 28% now. Even with this larger base of users, however, analysts are predicting only a 5% growth in this cycle. 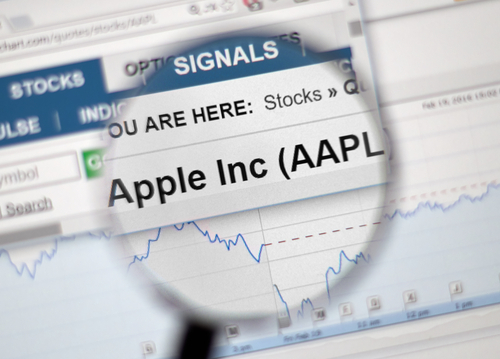 Nonetheless, shares of Apple went down less than 1% Wednesday, while shares have hovered, gaining 2.6% in the past three months, under-performing the S&P500 which increased 4% in the time period.